At least 15 people have been killed in landslides following floods in Indian-administered Kashmir, officials say. Rescue workers said they had recovered the bodies from the debris of a landslide which buried homes in Chadoora town. Some 200 families have been evacuated after torrential rain and a surge in the water level of the Jhelum river. More than 250 people died in September in what was described as the worst flooding in Kashmir in half a century. 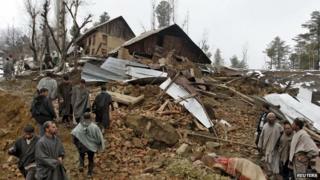 Police said the mudslides had hit houses in Chadoora, some 15km (10 miles) west of the main city of Srinagar. Rescue workers had recovered 15 bodies from the debris of two houses, police official Fayaz Ahmed told Associated Press news agency. Mohammed Sultan, a villager, said the ground above the houses collapsed without warning. "All of them just suddenly got buried alive. Now they are nowhere to be found," he said. Although it has stopped raining and the water level in the Jhelum has receded, more rain is forecast later this week. Authorities have set up 20 relief camps and urged people living in low-lying areas to move to higher ground. Last September's floods affected more than 1.2 million people and damaged more than 180,000 houses in the state. Did Kashmir 'abandon' its flood-hit people?